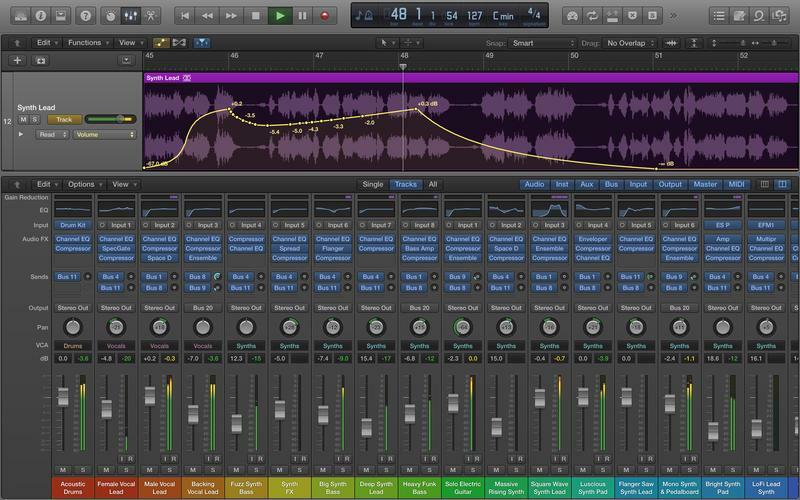 Logic Pro X is Apple's pro-level audio workstation software. It is a complete package of tools that can be used by a professional artist to create the best music track. Logic Pro X is used extensively by many of the top musicians and sound engineers in the world. Some of the other products that are used by popular musicians are Pro Tools, Cubase, SONAR and so on. As Logic Pro is popular software you can get a ton of plug-ins for adding more functionality to the software. The only thing to be worried about Logic Pro is that it is available only for Mac and Windows users have to move to Mac if they want to take advantage of this amazing software. There are so many amazing features in this software which can be used to customize and control the audio the way you want to the deepest detail. You can take full control over each track in your music by zooming in to the track. It has around 67 plug-ins, which include Pedalboards as well. So, let's dive right into the features of the Logic Pro X.
Interface: The user interface of Logic Pro X is really simple and easy to understand. It has a single-window interface where you can drag toolbars and file browsers and such, in and out of the view. The software provides you with plenty of keyboard shortcuts which can save a lot of your time. There is a Heads-up Tuner which can listen to the signals from the track when the input monitoring is enabled which can help you tune your stringed instruments. There are other tools like Beat detection which can detect the tempo of a track you import into it. Each piece of your recording is saved as a region and you have many options for customizing the music further. Composition: Logic Pro X is a friend of all the musicians and composers because of the music creation and writing tools that it has. You can take advantage of more than 3,600 loops included with the software. You can also download loops from the internet and use them in the software without any problems. When you import a loop to your project the loop gets converted to the tempo of your current project. This can be a really helpful feature. There are also instrument plug-ins in the software which include Alchemy, Drum Kit Designer, RetroSynth, UltraBeat, ES2, Vintage Organ, Vintage Clav and more. MIDI plug-ins like Arpeggiator, Chord Trigger, Modifier, Modulator, Randomizer, Transposer etc. are also available in Logic Pro X. Recording can be done without a lot of effort with this DAW. The Low-Latency mode allows the performer to hear exactly what he needs to hear. Seamless punch recording features are available that allow you to drop in or out at predetermined in and out positions. Logic Pro X supports OS X Core Audio which helps users to choose the audio interface that best suits their needs. It helps to produce a pro studio quality sound. MIDI recording is also possible in Logic. There are advanced options when it comes to MIDI recording. For example, if you are creating a drum loop, you can configure Logic to record each pass in different tracks. And after you record your loop you will have your hi-hats on different track and kick on a different one. Logic can record MIDI data from your iPad or iPad Pro and a MIDI keyboard simultaneously. If you don't have any of these you can use the computer's keyboard to play the music. If you don't want to play the music you can place the notes and create music using the Step Input features. Sound Design: Sound designing is an important part of a successful music track. You can enhance the quality of your audio with sound designing. Logic can help you out and make your job easier with all the features that it possesses for sound designing. You can use the Region Based Automation option to create effects that repeat when you duplicate or loop a region. Drum Replacement is another amazing feature which helps you out with problematic drum tracks. If you find any such problematic drum track you can use triggered samples and even replace any of the drum sounds in the track. Speed fades is another innovative feature which lets you create tape-style speed-up or speed-down at the beginning or end of a region. There are Effect plug-ins which include Amp Designer which emulate the sound of 25 famous guitar amplifiers and the speaker cabinet used in them, Bass Amp Designer, Pedalboard, Delay Designer, Distortion Effects, Fuzz-Wah, Ringshifter, Pitch Correction, Reverb Effects and many more which you can use to give final touches to your music. Mixing and Automation: Logic Pro X supports 255 audio tracks, 255 software instrument tracks, 255 auxiliary channels and a nearly unlimited number of MIDI tracks. No one should need more than these much tracks in their music project. There are also eight effect sends and 15 audio plug-in slots per channel. You can bypass each of the effects and listen how the audio sounds without the effect applied. All the parameters of the mixer can be automated. Automation can be applied to a single track or individual regions. It is easy to set automations. All you have to do is activate automation recording for a track and move the controls as the track plays. All your moves are captured and they are saved as the automation. The next time you play the track, the automation starts to affect the track or region that you recorded. You can also synchronize the writing and editing of automation for multiple tracks using Track Groups. Different Production plug-ins are also available in Logic Pro which include Compressor, Channel EQ, Exciter, Speech Enhancer, SubBass, Gain, etc. Some of the Mastering plug-ins available are Linear Phase EQ, Multiphaser, Limiter, Multimeter, etc. Logic Pro X can transform your MIDI performances into music notations in real time as you play. A Score Editor is present in Logic Pro X which can help you convert your performances into printable scores. This can be really useful for anyone who knows how to read music. You can graphically edit the length of notes as well as pitch, like you do with a Piano Roll Editor. You can also create guitar notations. You can also input guitar chords with alphanumeric chord symbols as well. You can choose a chord from the Logic Studio Library which features more than 4000 chord grids or you can choose to create your own. Logic Pro X is priced only $199.99. This is a really low price for such a powerful DAW compared to other programs like Cubase, Reason, etc. It has a lot of great stock content. It can easily integrate with your iPad which can save you a lot of your time. It is only compatible with Mac OS. Logic Pro X is one of the best digital audio workstations out in the market. If you are really into digital music creation you can definitely opt for this DAW without any hesitation. It is a complete value for the money. But, you should first check whether you have the compatible system. Logic Pro X requires a Mac with at least 4 GB of RAM. If you have a powerful system, you can definitely take the full advantage of the software. I hope you have gained a good enough understanding of what are the features that this DAW offers. Thank you for reading. Happy composing!